The Stratosphere has the distinction of being the ONLY strip casino that is actually located in Las Vegas! Its rooms are clean and comfortable and always a bargain price. Its selfservice garage is nice, its a short cab ride to MidStrip or Downtown. Just sitting in the lounge and enjoying the view is fine. Its not a Mega Property and it doesn't pretend to be, but it gives its customers one of the best bangs for the buck in town! Casino has low table minimums for craps, roulette and blackjack. Its blackjack is 3:2 rather than the 6:5 that many other casinos try to sneak in an unsuspecting customer. Stratosphere offers lots of BJ tables at a 5.00 minimum with a 0.36 percent house edge while at the Venetian the minimums are higher and the house edge is 0.49 percent. The Strat offers TEN times odds at their craps tables, while the Venetian offers only FIVE times odds and requires a much higher minimum bet. I've been asked about that 'only in Las Vegas' comment. The geographic boundary of the city of Las Vegas, Nevada includes The Stratosphere, but all other "Strip" casinos are technically outside of Las Vegas. The Stratosphere is often described as appealing to budget-minded tourists but I think many of the Stratosphere's guests would be described as "value minded" since the casino offers such advantages other than merely low-priced rooms. The Stratosphere has received praise in several subjective categories, such as best pool for females who want sunshine and water but not zillions of gawking males. Yet even though it has a good reputation it is embarking on a pool renovation project. 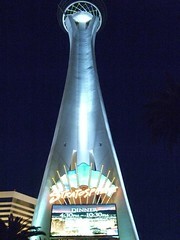 The Stratosphere also received praise for its poolside gambling which was described as cheerful and low-minimums as opposed to the higher minimums at other swim-up Blackjack games. So the Stratosphere is not just a place for low priced rooms but is also a place that provides value despite the low priced rooms.